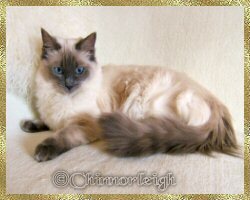 chinnorleigh ragdoll breeder - ragdoll girls, ragdoll breeding girls, female ragdolls. white tail tip ragdolls. chocolate & lilac ragdolls. 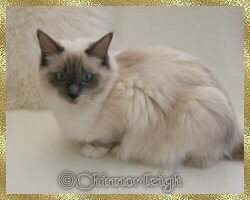 colourpoint, mitted, bicolour, high mitted bicolour, mid high white bicolour ragdolls. Gypsy is very much like her mum Daisy, not only in looks but in purrsonality too. She is also as mad as a hatter & doesn't walk anywhere but charges with her tail flicked up like a revolving question mark!! Her favourite toys are hair bobbles (especially ones that belong to my daughters) & constantly wants you to play with them with her. Once you start a game of 'fetch the bobble' Gypsy will not leave you alone. Gypsy & her siblings, Jaque & Belle were hand reared for the first 5 weeks of their life by my very good friend Sue Allen (Spiritdancers Ragdolls). I then took over the process of weaning them which took another 5 weeks!! This was due to their mother developing severe mastitis & having to have around the clock care, once Daisy was stable enough her babies came back to us. Due to these babies being hand reared they are extremely loving & want to be around 'humans' the whole time, they are in your face the whole time chirruping & meaowing away - I wouldn't have it any other way!! Gypsy has a plush silky soft coat that is pale in colour. She has good boning & good length to her body and good length to her tail. Gypsy has beautiful blue eye colour and as she is still quite young I think that Gypsy will be quite stunning when she matures. We were very surprised but very pleased to discover that after submitting a DNA sample to Animal DNA Laboratory in Australia that Gypsy (who is a Traditional Ragdoll) carries the gene for chocolate (B/b). 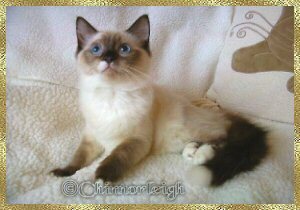 I am working alongside a small group of other Ragdoll entusiasts who have also discovered through DNA samples that some of their Ragdolls also carry the chocolate gene. We are working together to produce more visual chocolate and lilac Ragdolls that we thought were lost long ago from our Traditional and English Ragdoll lines here in the UK. There are plans ahead but this may take many years for us to produce a good foundation of chocolate and lilac Traditional Ragdolls within the group. Please take a look at our Chocolate and Lilac Ragdoll website. Gypsy will be retiring very soon. Apart from their pattern Belle & Gypsy are almost clones of their mother Daisy & share her fantastic character. When these babies were born they resembled little gremlins with their long bodies, little heads, huge batty ears & big blue eyes! This look has come from their maternal Grandmothers lines 'Spiritdancers Tangoinblue' (Moo) as all her babies have this look but they soon develop into the most stunning Ragdolls of good type & with excellant temperaments. Belle is no exception, she is absolutely beautiful & I know that in a few years time when she matures she will be stunning. Belle is slightly bigger than her sister Gypsy & this is because she never stops eating!!! She is of good type, with good boning, good length to her body& tail & a beautiful plush, soft silky coat which is still very pale in colour. Like her brother & sister, Belle is also extremely loving & in your face, she loves to snuggle on your lap. Minnie is a typical 'naughty tortie' & where there is trouble you are sure to find Minnie the Minx!!! Minnie is also a real softie at heart & absolutely loves to be cuddled. She will quite happily lie on her back & have her tummy rubbed for hours. Minnie has the loudest purr of any of the Raggies here and as Minnie sleeps on my bed at night & I don't know who is the loudest, Minnie purring or my husband snoring!!! Minnie is mismarked due to her coloured nose blaze & so unfortunately she can not be shown. Once you can see beyond her mismark Minnie has fantastic type with the beautiful sweet Ragdoll expression. She has a beautiful profile, a full muzzle, a good balanced chin, wonderful eye shape & set though they are slightly on the pale side. She has good ear shape & set with good width between them (though in the picture they look high due to her concentrating for the photopgrapher). Minnie has a good flat plane to the top of her head. 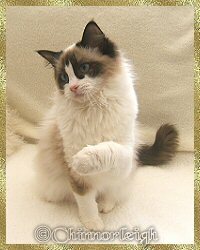 She has good strong boning, a beautifuly furnished tail of good length & she has the correct soft Ragdoll coat. She is truly beautiful! Minnie also has just as an interesting pedigree as her colour & pattern. Her sire 'Cowboy' is from 100% 'English' lines & on her dams side Minnie is the 3rd generation from the first Red Series Ragdoll that was imported into Britain from America, 'Marala's Cafe au Lait' (along with Marala's Hot Shot) & 4th generation from the first Tabby Ragdoll imported into Britain from America, 'Meadowpurrs Tigerlily', these three Ragdolls being imported by the Happytyme & Trendipuss Catteries. Minnie is 6 generations of successful 'Happytyme' breeding. Minnie will be a great asset to my breeding program as she is my first red series Ragdoll. Minnie produced her first absolutely beautiful babies in November 2010 'Bonfire Night' of all nights. Minnie has proved to be an excellent mother if not a little over protective as she will not let any of the other cats near them! She wants them all to herself!!! this absolutely beautiful little girl. Queenie is a very beautiful seal high mitted bicolour. She is from the first litter sired by my handsome Teddy and also the first litter from my beautiful girl, Belle. Both Teddy and Belle are mitted Ragdolls which can produce 3 patterns of Ragdoll, colourpointed, mitted and high mitted bicolour. As Teddy is seal and Belle is blue, Queenie who is seal will carry the blue gene. When Queenie is old enough to become a mother and when put to a colourpoint boy (Leo) Queenie will only produce mitted babies. Queenie is a 2nd generation of Chinnorleigh breeding. Queenie got her name due to the little heart shape on her bicolour mask (plus the fact she simply stole my heart). I then named all her siblings after playing cards! Though Queenie looks purfectly marked she has a slight T-shirt sleeve to her right front leg and has a tiny little freckle to her back left leg (though this should not hinder her if she was to be shown in competitions). Queenie has stunning blue eyes just like her daddy and a beautiful silky coat just like her mummy. She has the most beautiful and sweet little face with a lovely profile. 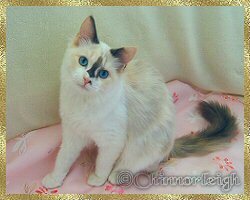 She really is a beautiful little girl with the wonderful Ragdoll temperament - I look forward to seeing how she develops as she grows. Kandi is my long awaited seal mitted girl with a beautiful white tip to her tail (just like her ancester Daddy Warbucks). Kandi is three consecutive generations of having a white tail tip. Both of her parents have beautiful white tips to their tails as do both of her Grandparents on her mothers side. Though Kandi's Grandparents on her fathers side do not have white tail tips they have produced many kittens in their litters that do have white tips to their tails. Kandi's father Appollo, is from 100% pure English lines whilst her mother Tipsy, is from a nice mix of old English and old American lines. Kandi's mother is from Lynn Breslin at Hollygram Cattery in Scotland. Kandi is the newest member to join our Raggie family and has certainly settled in with us purrfectly. It is as though she has always lived with us! Presley is smitten with this loving little purr box and they are often found snuggled up together in 'his' bed. Presley also follows Kandi around the house, I think in his way he is just showing her around his home! Daisy is actually besotted with Kandi's tail tip as she thinks it is a little white fluffy pom pom stuck to the end of it! Every time Kandi walks or runs past Daisy Daisy has to give chase to the little white fluffy thing flying through the air!!! Daisy has also been teaching Kandi how to play fetch and Kandi is so proud when she returns her little spongy ball in her mouth and gentle drops into your hand. She is so clever. Kandi has fantastic eye colour and although she is mismarked she does have wonderful type that compliments her loving and laid back temperament. I will look forward to watching Kandi as she matures into a big and beautiful Raggie.